Here’s a picture of my writing space. I try to fill my home and office with things that I love and have collected over the years and lots of COLOR! I love the color of this room. It is makes me feel energized and focused. The pictures on the wall are framed hankerchief’s of my grandmother’s. She lived in at time when ladies carried beautiful hankercheifs instead of tissues. My dad still carries a hankerchief. The Effiel Tower sculpture reminds me of my various trip to Paris. 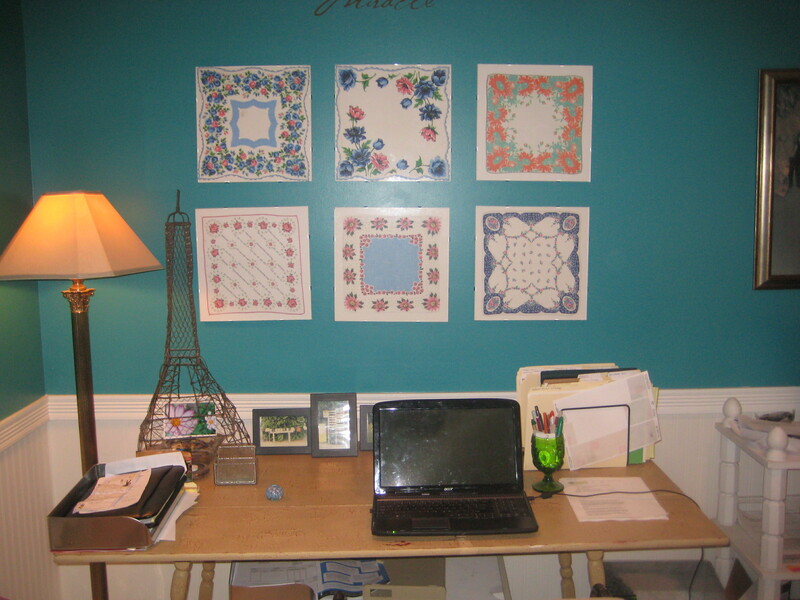 The framed photos at the back of the desk are from our lake cottage (the inspiration for Indian Summer). They remind me of many wonderful summers spent with family and friends at the lake. My family started a tradition of collecting little figurines from the different places we’ve been on vacation. I have the Chrysler Building from New York City, Big Ben from London, the Golden Gate Bridge from San Francisco, the Coliseum from Rome, the Acropolis from Athens, and many others. They have a spot of their own as they take up too much room on my desk. Here are two quotes I like about life and travel.